You are here: Home » Take the Plunge into Marine Science! 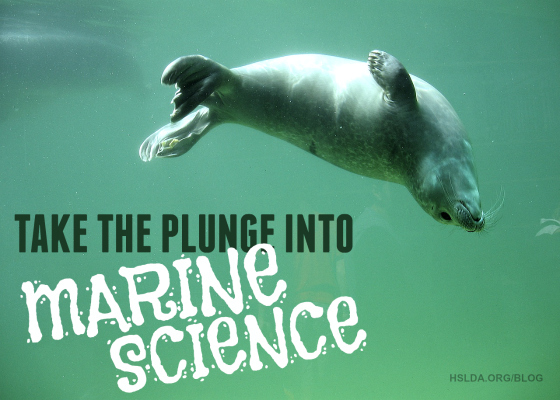 Take the Plunge into Marine Science! Most high schoolers complete 2-3 years of science usually consisting of Physical Science, Biology, and Chemistry. However, some students struggle with that regimen while others dream of more exotic science careers. Both types of students will benefit from different science options. High school teens enthralled by an aquarium show featuring sea lions, seals, dolphins, and killer whales might be good candidates for marine biology. To test the waters before jumping into the deep end, consider an introductory half-year Ocean Biology class. For mothers who feel up to the challenge of creating their own science course, consider crafting a half-year course around this Marine Biology textbook in conjunction with the Marine Biology Coloring Book. Students who have flipped over Ocean Science may want to consider a one-yearMarine Science course or Apologia’s Marine Science course. Students captivated by marine life will need to buckle down and study chemistry next, but now students have a reason to study this often underappreciated science. Fortunately, many curriculum providers offer chemistry. I also recommend Chemistry: Matter and Change by Glencoe. They offer free online self-check quizzes, and you can purchase a helpfulStudy Guide and Solving Problems: Chemistry Handbook. Both are good resources for any chemistry course. Purchasing the 2004 edition will save money. Contact the publisher directly to purchase the Teacher’s Edition. During the junior or senior year, more serious students should consider a one-yearEnvironmental Science course. Do-it-your-self mothers may consider purchasing the Environmental Sciencetextbook. The publisher has a marvelous online study guide with pdf downloads to help students learn chapter material, and this online resource would benefit any student studying environmental sciences. Seniors interested in the field can take a online one-year Advanced Placement (AP) Environmental Science course. Not surprisingly, high school graduates interested in working with marine animals will need to take Psychology 101, which can be completed either throughdual enrollment at a local community college or via an online AP Psychology course. Giving our inquisitive teens a vision for the future will help them dive deeply into new subjects and successfully navigate unfamiliar waters during the high school years.